With the rising cost of college, the high college drop-out rate, and the growing amount of time it’s taking students on average to complete the classic four-year bachelor’s degree, more and more jobs are coming to understand that work experience is just as important as a college degree. However, lacking a bachelor’s degree is still a major hindrance to the job hunt…unless you know how to work it right. The first step is understanding what is expected of you to be an employee that fulfills the duties of the job to the satisfaction of your employer. Understand your skills and understanding, and how they apply to your ability to accomplish this. The more you understand, the better positioned you will be to articulate this understanding to your potential employer in your resume, cover letter, and interview. The second step is creating a resume and cover letter that accentuates the training, skills, and understanding that you’ve developed through direct work experience that are applicable to the job. Remember, even work experience you didn’t get paid for still counts. Volunteer work and internships through which you were educated and trained are essential components to this resume. Highlight relevant work experience and the duties on the job that pertain to the job you are applying for, and also highlight skills you learned in these jobs directly in your cover letter. The third step comes when you’re called in for the interview. You need to be prepared to explain why you haven’t completed a degree, and be honest because if you’re not it will hurt you in your interview. Keep in mind, what your employer wants to know is that you can excel at the duties and responsibilities of the job given your experience, skillset, and knowledgebase. Show how your work experience and on-the-job education applies to the position in question. Some employer really do place high value on potential employees having a degree, but it is unlikely you will end up at an interview if this is the case. While landing a job with work experience and no degree is far from impossible, it is still a hindrance. However, if you have the work experience to compensate for your lack of degree in an interview, chances are you already have a degree equivalency with the years of work experience you have if you learned skills on the job. 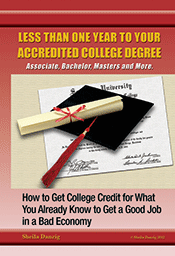 You may not even have to enroll to earn a degree. To learn more, visit TheCareerPeople.com.